Covering a major sports beat isn’t a lot of fun most of the time. You are always trying to beat the other guy, get the scoop. You make things a competition because that’s part of the business. It’s always been that way and it probably always will be. Richard Durrett was part of that but Richard was different. He was better than the beat because of the kind of person Richard was. In a cut-throat business Richard didn’t fit in because he was nicer than the rest of us. That’s what made him so special. That’s why the news of Richard’s death Tuesday is so tough to take. The world needs people like Richard because Richard made things better for everyone around him and he made it a better place. Richard, who had worked for ESPN Dallas since 2009, was the kind of guy who would transcribe quotes for you and send them your way while you were driving to another site just because. It didn’t matter that you were working against him or that you would beat him with the story. Richard was the kind of guy who would see if you needed a ride while you were on a road trip because he wanted to make sure you got the park. Need directions on how to get somewhere? Call Richard. He’d tell you. I did it a couple of weeks ago for about the 50th time in the eight or so years that I’ve known Richard. Richard was better than the rest of us because Richard didn’t know he was better than the rest of us. We joked that Richard never took a day off because he cranked out more stories per day than anyone else in the pressbox. While we all struggled to make deadline by writing, Richard didn’t just write. Richard did radio. Richard did television. And while we’d never admit it to Richard because that’s not the kind of business we’re in, he did it better than any of us could. And if you thought Richard was just a baseball guy, you’d be wrong. While we all mainly focused on baseball, Richard also knew more about sports than the rest of us. Want to talk Auburn football? Ask Richard. Same goes for TCU. Same goes for horse racing. Same goes for hockey. Same goes for fantasy golf. And auto sports. Throw in Cowboys while you’re at it. And if you want to know some random facts about Montreal, ask Richard. And just about anything else you could think of. Richard wouldn’t brag about it either. He just knew his stuff. I was fortunate because I considered Richard a friend. On my first ever Rangers road trip, Richard took me around the city of Toronto. He may have known me for about a month total at the time. This was when I was working for the Fort Worth Star-Telegram and Richard was at the hated Dallas Morning News. Of course Richard never saw it that way. He was too good for that kind of petty stuff. When I was overserved on my first night, it was Richard who called me the next day to make sure that I was okay to get to the park. When the Rangers were wheeling and dealing at the trade deadline in 2010, I was having lunch with Richard in Anaheim. While trades were flying, Richard just sat there and ate with me. Then I’m pretty sure he went and scooped me on a story. That’s because he was good at his job. When we were at spring training, I ate countless lunches with Richard. That included riding with Richard in his Volkswagen Bug rental car. I was too manly to rent a car like that. Richard didn’t care. When we made fun of him for the car, Richard laughed it off. Stuff like that didn’t matter to Richard. It shouldn’t matter to anyone else either. When we went out for drinks during spring training, it was Richard who would drink a White Russian or a Bloody Mary while we drank beer. When we laughed at Richard for that, he laughed too. He was more secure with himself than we were, that’s for sure. Now Richard didn’t always hang out with us, he would leave early to go watch stuff like ‘Downton Abbey’ and of course Richard knew his Olympics ice dancing. Of course he would. That was Richard. He liked that kind of stuff and didn’t care what anyone thought even though he took more needling than anyone should. He was never fazed. Probably because while everyone has insecurities, I’m not sure that was the case for Richard. Again, more comfortable than us. He’d also leave early to Facetime and read books to his son Owen and his daughter Alice. Of course they mattered more to him than any stupid baseball game or drinking beer (or a Bloody Mary) at a bar. Same goes for his wife Kelly. The death of Richard makes no sense but I consider myself lucky because he was a friend. Sure I’ve cried but that’s because I’m selfish. I enjoyed my time with Richard and wanted more. I should feel fortunate that he was part of my life. 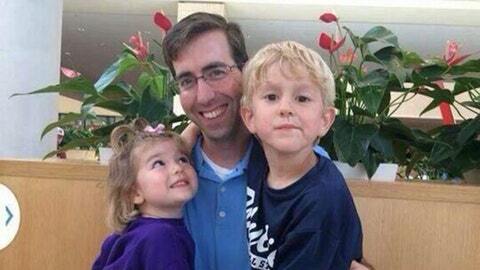 My thoughts and prayers, and I’m sure everyone else that ever talked to Richard, go out to his wife and children. They, like the rest of, know how good of a man he was.